Thinking about joining the Dublin-Worthington Rotary? You’d be joining an international organization that values service, personal integrity and strong relationships. We provide service to others, promote integrity, and advance world understanding, goodwill, and peace through our fellowship of business, professional and community leaders. Together we see a world where people unite and take action to create lasting change across the globe, in our communities and in ourselves. Fellowship and Global Understanding – We build lifelong relationships. Ethics and Integrity – We honor our commitments. Diversity – We connect diverse perspectives. Vocational Expertise, Service and Leadership –We apply our leadership and expertise to solve social issues. 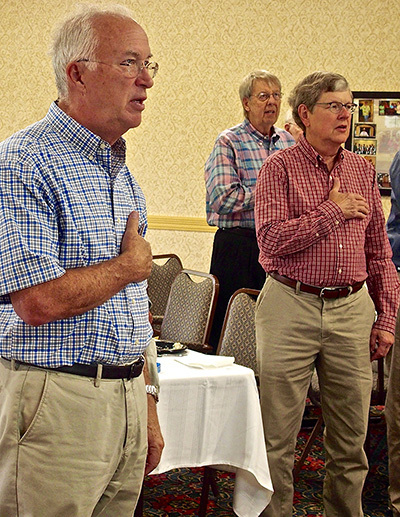 Four guiding principles have been developed over the years to provide Rotarians with a strong, common purpose and direction. They serve as a foundation for our relationships with other Rotarians and the action we take in the world. 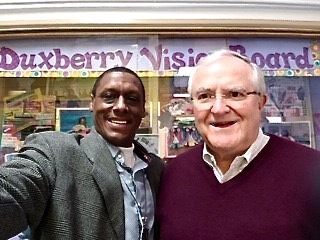 My friend, Vaughn Cook, and I had the very satisfying experience of delivering dictionaries this fall to third graders at Duxbury Park Elementary School on the east side of Columbus. It was part of the Columbus Rotary Foundation’s endowed project to provide dictionaries annually to every third-grade student in the Columbus City School system. Our club also participates in the dictionary project, and our members visit students and teachers in southeastern Ohio. We also help the Columbus Rotary in delivering dictionaries locally. We showed the students that unlike a cell phone (where they can also look up words), the dictionary doesn’t cost anything for them to have, doesn’t need to be charged, won’t break if it is dropped, and allows them to see more than one word at a time. Plus, there are maps, state capitals, the U.S. Constitution, and the longest word in the dictionary (no, it was not supercalifragilisticexpialidocious – which I spelled and wrote out on the board for them). The excitement in the students’ eyes was terrific! I’m glad our two clubs and others across the state and country participate in this Rotary service project each year. For me, this experience in service is what Rotary is all about. THEN JOIN US IN SERVICE.